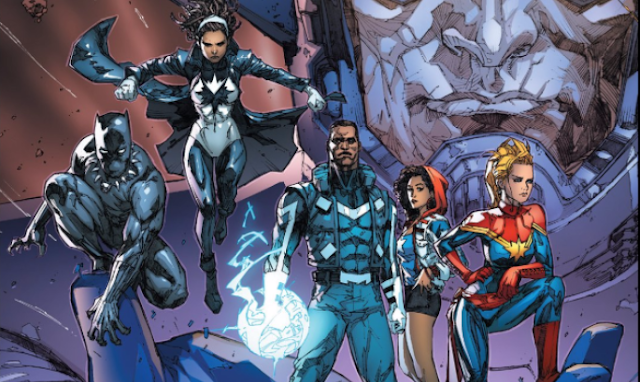 After the latest Secret War saga finished Marvel released the titles of the new 'All New, All Different' line, The Ultimates was one that immediately grabbed my attention. With the tag line, 'Ultimate problems need Ultimate Solutions' and an awesome cast of characters, Captain Marvel, Miss America, Black Panther, Spectrum and Blue Marvel, this series should be a classic. And the good news is, it is damn good! Out of the team, it is possibly Captain Marvel and Black Panther who need less introductions. I love Captain Marvel, I think she is awesome and her own recent comic book title gave her a large and loyal fanbase. Black Panther has never been a hero that has interested me just because he is rarely in various comic books but I know he is pretty cool and they are both getting their own films soon. Coincidence? Blue Marvel is an underrated character and his power set would be enough to give Superman a run for his money. Spectrum, once the leader of the Avengers for a while is a character who has changed her superhero name more times than Kitty Pryde and can turn her body into different waves of light. And then there is Miss America who can fly, has super speed, super strength and the ability to punch holes through reality and travel between them. All in all, they are the perfect team to give the ultimate solutions to the ultimate problems. There is a lot of backstory in these pages, as there usually is with these opening issues but that is only to get the audience up to speed with the different characters and give them all enough reason to be included in these pages. The first issue doesn't hold back on the major villain front with it being obvious that Galactus in included as the villain of the piece. Galactus is one of Stan Lee's and Jack Kirby's creations and one of the most endearing characters and is a true threat. So it makes perfect sense that he should be the problem in these issues. Quite what they have in mind to solve the Galactus problem isn't clear yet. While Captain Marvel and Bluue Marvel try to hold of Galactus, Spectrum and Ms. America attempt to hold off his ground forces on the next planet on his menu Moroder-o. Artist Kenneth Rocafort is one of the best in the business and the art throughout this book is beautiful. From the otherworldly spaceships and Captain Marvel's absorption of energy there isn't one boring panel throughout this entire book. Galactus proper, doesn't feature much in this issue but when he is revealed, the art of that panel is worth the cover price alone! Overall this is a great first issue that instantly set this series up to be one of the best and most memorable for some time to come, with great art work and a fantastic cast of characters!